I love the word Apocalypse. It rolls off your tongue with such ominous tones and strikes just the right feeling of dread – when you want to give people a verbal whack-upside-the-head. And, I also like the word, because it is so heavily misused by Americans. …Apocalypse does NOT mean disaster. It’s Greek, and it means ‘revelation’, or more literally, ‘un-covering’. Let’s see… where was I …ah yes. So, the word means an uncovering or revelation, but we use it for disaster. And, THAT gives me an opportunity for a delightful double entendre. Every time you see me use the word Apocalypse, it’s always in terms of BOTH a revelation AND a disaster. …a silver apocalypse is coming. When Harvey said that the global financial system was going to collapse over the next four months because of silver and gold… well …you can imagine how quickly I sat up and took notice. But, at the same time, I couldn’t be completely sure that he was right. Well, we got some. Yesterday. 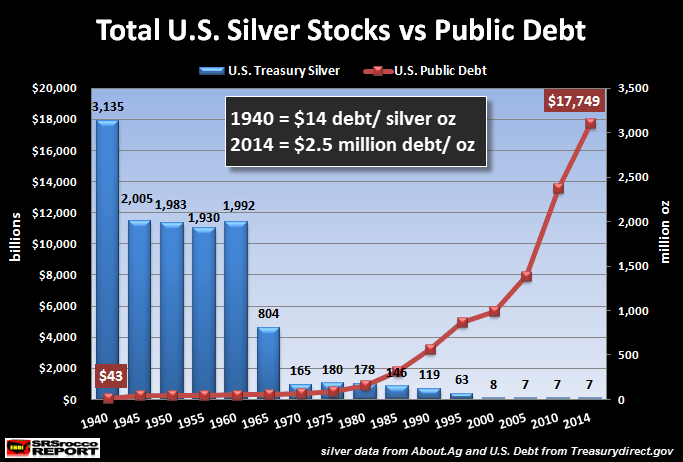 Above graph is from The Collapse Of U.S. Silver Stocks As Public Debt Skyrockets. The Devil just signed our death certificate. We’re dead. That 7 million ounces of silver that they say the US has? That’s a lie. Try zero. It’s the same kind of lie that says that we have 8,000 metric tons of gold in Fort Knox and elsewhere. You weren’t born yesterday, right? China uses two million ounces of silver in its industry – every month. And, they only have 2.9 million ounces in current inventory. Furthermore, China signed a ten year agreement with the US in 2003, leasing thousands of metric tons of silver to America, and they want it back. We are about to hit the point where the Lying Liars can no longer hide the fact that there isn’t enough silver to meet demand – at a price of less-than $19/ounce. This will cause a ‘failure to deliver’ on one or more silver contracts. That silver default will wreck the precious metals markets. The price of the physical metal will explode – out of sync with the official ‘paper markets’. This wreckage of the precious metals exchanges will ripple through the other commodities exchanges, and then out onto the wider financial markets. The Powers That B will try to keep the damage from spreading, but I doubt that they’ll be successful. They do not seem to have much in the way of ammunition for fighting such battles. We’ll see what happens, but you should NOT be optimistic. And frankly, it all rests in the hands of the Chinese. THEY are the ones with the power to set in motion this implosion of the precious metals markets – and the collapse of the global financial system. The question is whether they are ready to pull the trigger on such an event. You do NOT want to be caught in the fallout of this collapse. You really don’t. This means that you MUST get as much money as you can out of banks and any other institution. And yes, I really do mean bank accounts, retirement accounts and everything else. My wife and I did that, and you should too. It’s probably not the best plan, but use it until you find one that’s better – and then tell me what that best plan is. Before you go out and buy as much silver as you can carry and as much gold as you can afford, there’s something that I want you to do. It’s very important. Make sure that there is no one in desperate need around you. …No, no, not like that. I mean really, REALLY look. Is there anyone that you can think of that needs help? Would at least SOME of the money in your hands make a difference? I’m not saying that you need to give away all of your life savings. And, just because someone needs money doesn’t mean that it’s a good idea to give it to them. Wisdom is needed here. But, we Christians have spent too much time stepping over the poor and ignoring the needs of the hungry. And, THAT needs to stop. Dylan was stolen away by CPS, and his mother is in a life-and-death struggle to get him back. And, there is evidence that this little boy is getting molested, while in foster care. Dave Hodges of thecommonsenseshow.com vouches for the authenticity and desperate need that little Dylan has. You can trust Dave, when he says that this is the ‘real deal’. God bless all of you who stepped up to the plate, on Dylan’s behalf. Now, with the money that you have left, go out and buy as much silver as you can. In my Friday article, I asked you guys to tell me of Christians that you know who deal in precious metals, and I got some great comments in return. So, here are the dealers that many of you told me about. Again, please leave a comment below and tell us about a Christian dealer in precious metals that you personally know. I would be more than happy to add to the list. Forgive me if I am being obtuse, but I don’t get the connection between amount of public debt and oz of silver. I have no doubt that public debt has skyrocketed and our precious metals looted, but a correlation is not the same as a causal effect. In 1940 they hadn’t invented credit cards yet, and the trend of excessive consumerism hadn’t taken off yet either. So yes, we are definitely going to hell in a handbasket, but is there some connection here that I missed? It’s my fault for plopping that graph in there without explaining why it was so significant – and what parts weren’t. There is an indirect causal relationship between government debt and silver (or gold), since delinking currency from a hard asset always leads to deficit spending – because politicians can’t keep their hands out of the cookie jar. However, that wasn’t my point. The point that I was trying to make was about how low our silver reserves were – in fact, how low they were, worldwide. SRSrocco was providing supporting evidence for Harvey Organ’s point about the collapse of silver stockpiles. And that is an extremely serious situation. I hope that cleared things up a bit. Sorry for the confusion, DRG. I always liked old United States silver coins. They are relatively cheap and they are in smaller denominations…you can make change! The “penny” in the New Testament was a silver coin about the size of a silver dime. It was a days wages…therefore, if you have 365 silver dimes, you will have a years savings. Excellent, excellent point – as always. They call it ‘Junk Silver’, and it truly can be one of the best deals around. And, junk silver has the added benefit of being hard to fake. As always, people need to do their research, so that they know what they are looking for – before buying. Your article is very well thought out. However, not everyone is up for buying silver. I drank the coolaid in 2011, listening to the same arguments that you have presented. I have since lost half of my inheritance by investing in silver. People should be aware of the risks of buying silver. Now, I agree, that the current prices look very enticing, but that does not minimize the importance of understanding the risks involved. In my humble opinión, a person should have a mix of gold, silver and cash. Lots and lots of cash, stacked and packaged carefully, and hidden away. This opinión comes from someone who has lost half his life savings investing in something that was supposed to help me survive in the future. Silver in particular is certainly no panacea. Don’t rely too much on silver. Yes, you bought at the top of the market, and that always hurts as it goes into a correction. I’ve done that, so I know how you feel. But, please understand that this isn’t an investment. This is insurance. And, those dollar bills will ONLY be useful in the very short term, for a very short period of time. Tangible assets are the only sure store of value that we have right now. It doesn’t have to be silver. It could be anything, but silver and gold are the only assets that I know of – that are depressed, right now. Hang in there, Glen. I’m afraid that silver is going to come roaring back – along with a collapse of the system. Apparently, you didn’t see the wisdom of also finding a local precious metals dealer that you can work with for smaller amounts of silver, like I do (cash deals with no paper trail). Keeping your money local and building strong relationships in the community. Not to mention that you have a local, close by source, to sell some silver back to if you need to convert the silver back to what ever currency may be being used in a post collapse scenario. I can walk to my dealer in five minutes. How convenient is that? You have got to be kidding! Do you mean the US Government of Goldman Sach, the Synagog of Satan, whose father is of the Devil. Ha! In America, it is “We The People” who are the government, any law made contrary to The Constitution is null and void and of no effect, and should not be obeyed. So, according to Natural Law, Common Law, or Gods Law, they have no authority over me for they have violated their trust, and oaths. No King but Jesus! I live buy God’s Kingdom principles and anything I have belongs to Him, technically, not the Kingdom of this world. So, if they did ever ask me how much silver and gold I have I would just have to tell them the truth, which is….. If any statement, within any law, which is passed, is unconstitutional, the whole law is unconstitutional by Marbury v. Madison. Family issues. Can you bottom line why I have lost $–, on silver. I want my daughter to quit bugging me about my “Bad Use” of our $. Thanx, And may G-d bless you greatly and keep you! I think the end of the US as we know it is here! Thank you for all your help, I am grateful. And shall pray for you and yours always. I’m sorry that your daughter is nagging you on this subject. Wait a while, and she will stop (‘cuz the price is going to go up). When I was in the investment business, I would always get calls from anxious investors when their investments went down – but they would never call me when their investments went up. This is the attitude of people who always lose money. I’ve seen this countless times, and there’s very little that you can do with such weak-willed people. But, what you have is not an investment. It’s insurance. In fact, the future of silver is so incredibly bright, you would be an absolute fool to sell it. Please also understand that you don’t have much in the way of alternatives. What else is depressed in value, that you can buy? The price of silver is being manipulated. The manipulators want you to think like your daughter does. I, for one, do not like being manipulated, and I see such manipulation as a reason to ‘stick to my guns’. Yes, silver is cheap – but not for long. Stay the course, Jacque. You made the right choice. I just knew you’d have the right words to say regarding silver. I look forward to your daily messages & words of truth …Thank you so much for all you do to inform us John..
many of the precious metals dealers are claiming the eventual death of the dollar and the subsequent explosion of the value of Gold and Silver, but, i am at a loss as to why these dealers are trading their “priceless” metals for “worthless” dollars especially at these suppressed rates?.. am i missing something?? shouldn’t they be following their own advice? thank’s kindly.. your site is always one of the most provocative and interesting reads. There’s a difference between being a dealer and an owner. Being a dealer is how they feed their kids and pay the mortgage. Think of it in terms of an organic farmer. If they think that organic food is such a great thing to buy, why are they selling it? Simple, they’re selling what they can’t consume for themselves. And, they get to support their families while doing you a good service. The same goes for precious metals dealers. I hope that helped, Francis. You have really simplified this issue John and I thank you for that. I’m sure I’ll have more to say at some point but right now I’m still suffering heavy grief over the death of my dog and we have my wife parents visiting this week from the evil empire. I tried to bring up one issue yesterday with them and they are clearly firmly planted into the matrix. I feel a need to go outside and start screaming and throwing things. I love dogs, so I know a little bit of how you feel. I call them people-of-fur (a play on the term ‘people-of-color’). They really are family, and they love us unconditionally. So, it’s devastating to see them pass away. Do the best that you can. If those few words were all that you could get in… well …that’ll be enough for God to work with. It is only by the miracle and grace of God that any of us are going to get out of this. Craig, keep up the good work, brother! Hi John. As silver supplies tighten, the prepared should keep in mind another form of silver, one that could save their lives…nanosilver (and colloidal silver). Nanosilver is a powerful weapon against viruses, anaerobic bacteria, yeast, mold, fungi and parasite eggs. Dr. Rima Laibow has publicized a declassified US Department of Defense study that shows that nanosilver at a concentration of 10 parts per million is effective against Ebola virus. Owning a nanosilver generator (or colloidal silver generator) can prove to be a powerful tool in providing for the health needs of others, especially considering the looming health crises we face. In His ministry, Jesus met the health needs of others. We should follow His example and do the same. This isn’t in my area of expertise or knowledge, but what you say sounds good. We really do need to the best that we can in such things – for ourselves and others. Hello John, Thank you for an excellent article, and for the reminder for those who have the means to help others as well as yourself! I agree there are too many Christians who seem to forget this. Thank you also for posting information on Dylan and his mom. I’ve been following this story, and they are truly in need of assistance. I also thank you for your assessments of world events and sounding the warnings that need to be told. I am afraid though that most just don’t want to hear it based on the people in my life who seem to want to be clueless! Question: Do you recommend investing all currency from banks, IRA’s etc., in metals? Is that really a wise idea? Keeping large amounts of cash or metals in our possession both seem risky. Would it be prudent to invest some money in a guaranteed annuity, or other type of stable fund? I know you cannot give specific advice to anyone, but if you have any ideas, it would be appreciated. Do NOT have any money in ANY institution of ANY kind. Zero. Zip. Nada. If you don’t hold it, you don’t own it. Period. So, take everything out. Of this, I am absolutely emphatic on. Leave only enough to cover expenses for whatever time period you feel good about. As to what you should buy with that money… gold is compact and can be hid. Silver is valuable and WAY underpriced – but bulkier. But, there are other things that you might be able to put your money in, if you know of something good to buy. Just remember that insurance companies and every other institution connected with money – in ANY way – will fall right along with the banks and investment companies. Thank you, Angela, for giving me the opportunity to clarify this. When the system fails, everything connected to it… fails with it. I’m thankful that you use your time to make your research and commentary available to people like me. I find your newsletter very useful. And most importantly after following you awhile it’s apparent to me that you are not afraid to speak the truth. For me the heart of the writer is the most important thing when I read things, and I respect your heart. Anyway, this is my first post, so I wanted to say those things but also ask for your assistance. I’m facing a tough decision and I’m hoping you are willing to share your experience with me. You mentioned in this post that you removed your assets from all financial institutions. Even retirement. I’m 29 and have a significant (to me) amount of money stashed away in 2 different retirement accounts. I’m marrying the woman of my dreams in January and about to start a new phase of life. I want to liquidate my retirement, but I just can’t make that leap right now. And above all, I want what The Lord wants for me. If you’re willing, could you share some insight on what your decision-making process was when you decided to pay the penalty and empty your retirement accounts? There is no way that the financial system can survive. If we had done things differently in 2008, and in the years before then… maybe it could have been fixed. But, they didn’t. So, it’s going to collapse. And, that includes all retirement accounts. That’s why my wife and I took our money out. I hope that helps, Greg. I’m glad that you found the woman of your dreams!